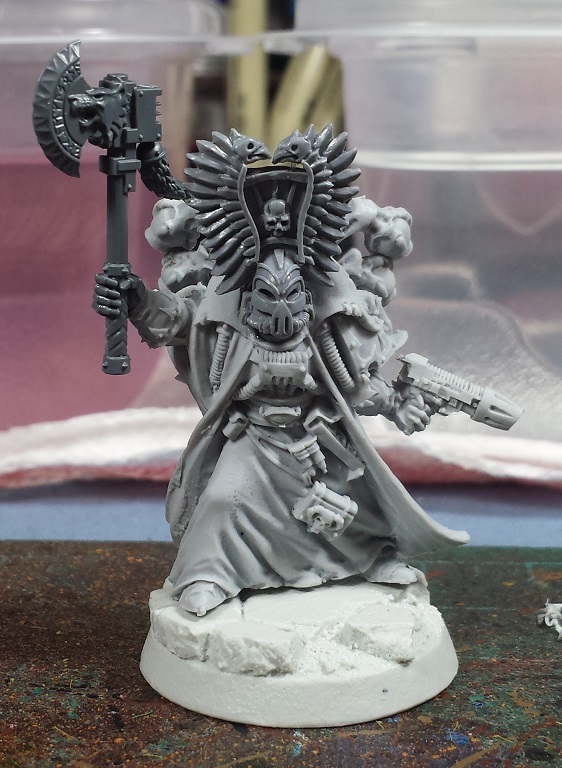 As a reward for getting a mess of painting done, I built up the first of a few characters I have planned. After reading Talon of Horus, I knew that I wanted to do a late-heresy version of Iskandar Khayon and his Daemon Wolf Gyre. 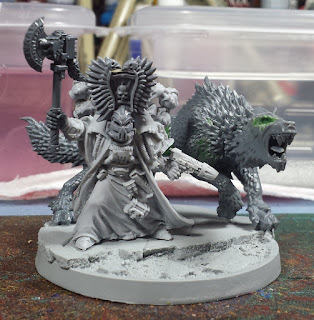 After working out a trade for some Space Wolf bits I ended up with all the things I needed to bring him to life! Khayon is remarked in the book as carring a reclaimed Space Wolf axe that he picked up during the razing of Prospero called 'Saern' which he refashioned into a force axe, as well as firing off a plasma pistol a few times. That's weapons sorted! 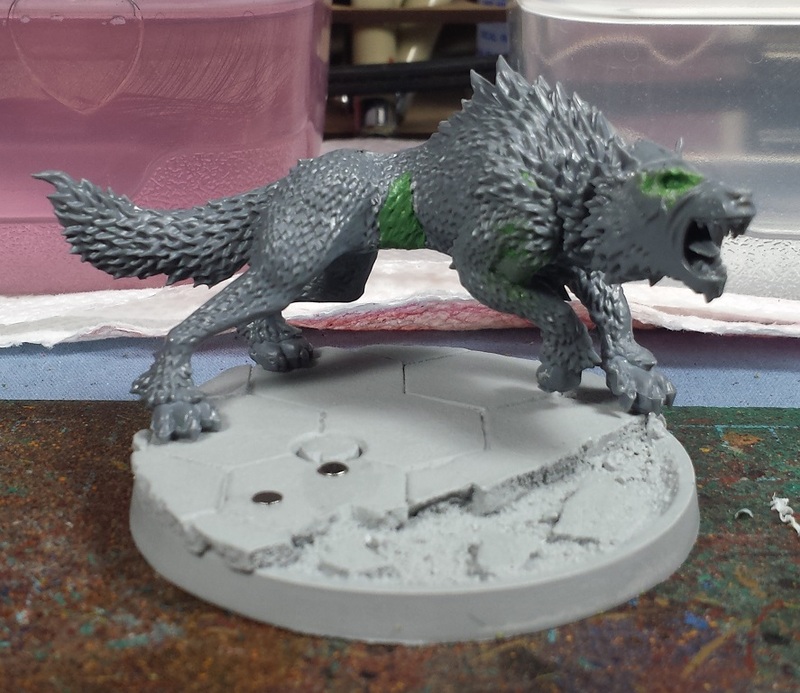 His Daemon Wolf Gyre was recovered from a half-built state that included some goopy glue which I'm hoping to downplay a bit in the painting stage. I scraped off the various straps and buckles and tried my hand at a little greenstuff fur which turned out passable - I'm definitely not much of a GS sculptor but gotta keep practicing I suppose! 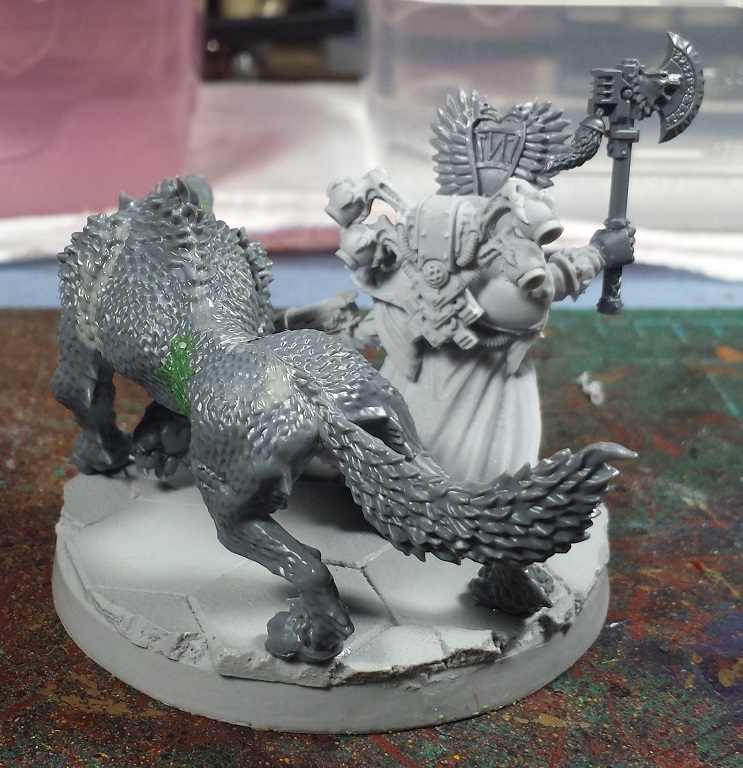 Of course, technically speaking one can't mount a character on a 60mm base so I'd designed it such that Khayon is magnetized and pinned to it, allowing him to be placed on a 'correctly-sized' base for gaming. I haven't come up with a good in-game explanation for Gyre and the big base so for the most part it'll just be a mini vignette for art's sake! Now back to the firing line and laying in the reds on the Rhinos this evening. If all goes well I'm hoping to have them done by Sunday's end! I love everything about this one already. Cool. Magnets are great aren't they? Both figures are probably painted by now! Does HH follow the same ideas about base size as 40k? I.e. it doesn't matter, its just assumed there on the bases supplied? If so then there is nothing stopping you, just the fact that you've a greater base area for combat. Looks amazing, cant wait to see it painted. Oh I had hoped to see someone do that character justice, great to see you giving him a go then. That's a lovely character and pet doggy! Great realisation of the character, I liked the character in the book, and his daemon wolf. If I remember it was quite a vicious thing! @Monkeychucka: Indeed! I don't use 'em as often as I ought to. @Riot Ville: Hah! Not quite, but soon! @Francesc: I'm interested to see what they do for KSons characters. 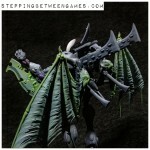 Ahriman is going to be in for sure, but curious who else will show up! @Steven Burden: It follows the same rough guidelines, so the gentleman's agreement is he ought to be on a 32mm base for gaming to avoid any "modeling for advantage" complaints. @Rory Priest: I would love to see that! Definitely have a go! @Col. Hertford: Hah! Gyre is one big doggy! @Bronislaw Czevak: Thanks! Aye, I knew as soon as I put the book down that I had to give 'em a go! Lovely rendition. And the only one I've seen online might I add? Dunno why you can't just keep him mounted on the larger base ingame - afterall, it would be to your opponent's benefit as he's a larger target that way! Heresy Era Thousand Sons - Bases! Glorious bases!